During 1973, two chemists at the University of California, Irvine -- Frank Rowland and Mario Molina -- were studying the effects of Chlorofluorocarbons (CFCs) on the atmosphere. CFC's are gasses that were widely used at the time in aerosol spray cans, fire suppression systems, air conditioners, refrigerators, etc. The team found that CFC's were amazingly stable. Once released, they would drift upwards through the atmosphere until they reach the stratosphere between about 6 and 30 miles above the Earth's surface. They reach the middle of the stratosphere after about five to ten decades, where they were finally broken down by ultraviolet radiation from the Sun. This releases chlorine. The chlorine, in turn, breaks down the ozone gas (O3) that naturally occurs in the stratosphere. Rowland and Molina testified before the federal House of Representatives in late 1974. The federal government later funded research into the problem. In 1976, the National Academy of Sciences (NAS) released the first of its many reports, confirming that ozone depletion by CFC was a real, serious, and growing phenomenon with long-term consequences. During 1985, scientists Joe Farman, Brian Gardiner and Jonathan Shanklin published a paper describing their observations of unusually low levels of ozone in the atmosphere at the Caird Coast, Antarctica, near the South Pole. This became universally known as the "ozone hole." There is no actual "hole" -- only a thinning of the concentration of ozone over a very large area. This image represents the largest "hole" in the ozone layer over the Antarctic ever measured. It is not a photograph. It was created from successive scans of the area by satellites in late 2006-SEP. The area of the "hole" was 11.4 million square miles or 29.5 million square kilometers. This is almost three times the area of the 48 contiguous U.S. states and DC. 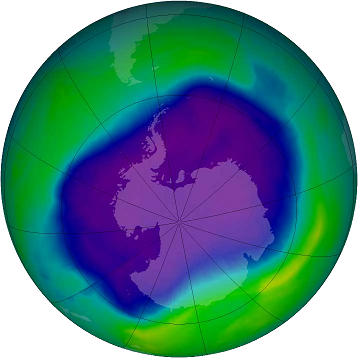 The purple-shaded area in the center is the location of the greatest ozone depletion. Blue, green and yellow-shaded areas have progressively higher levels of ozone remaining. The "holes" in the Arctic and Antarctic are not going away anytime soon. CFCs that were produced in the 1970's and 1980's are still present in the stratosphere, breaking down the ozone. It will take decades before all the CFCs break down and dissipate. Fortunately, there are relatively few humans living in the areas with major ozone depletion, so the "holes" do not cause major hardship. At their meeting on 2016-OCT-15, parties to the Montreal Protocol on Substances that Deplete the Ozone Layer agreed to also phase-out the use of hydrofluorocarbons (HFC's). Why has the ozone problem been brought under control, whereas climate change has not?" Replacement chemicals were available, and could almost immediately replace CFCs. There were only a few manufacturing plants of CFC's involved. The cause and effect relationship between CFC's, chlorine, and ozone was scientifically well known, proven, and accepted. There is a long, multiple decade, delay between stopping the use of CFC's and the restoration of the ozone layer. Thus, it was important to take action quickly. Replacing chemicals that deplete the Ozone Layer with new chemicals did not threaten the profit margin of major users of fossil fuels. Image was downloaded via Wikimedia Commons from Wikipedia at: https://commons.wikimedia.org/ It was created by NASA and is in the public domain. Michelle Thaller, "How NASA averted the 2060 apocalypse," Big Think Science, 2018-FEB-27, at: https://www.facebook.com/ Her disussion of the involvement of NASA begins at 2:09 minutes into the video.